GPs, dentists, pharmacists and opticians will not have to provide Welsh language services to patients under plans set out by the Welsh Government. BBC Wales understands Welsh language standards, to be set out on Tuesday, will not extend to primary care. Plaid Cymru said the decision showed a lack of respect for Welsh speakers. 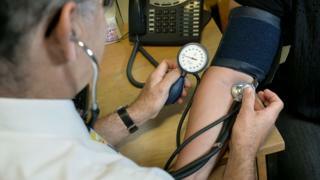 Welsh Government said it would comment further on regulations for health services once they were put before AMs. Health boards will be expected to provide some services in Welsh but they do not have jurisdiction over primary care. Language standards came into force in 2016, requiring local councils, the Welsh Government and national parks to make it clear that they welcome correspondence with the public in Welsh and giving the language priority on bilingual signs. The Welsh Language Commissioner Meri Huws has previously said it is "essential" that the standards extend to primary care. In response to a government consultation in 2016 Ms Huws said: "As primary care is the first point of contact for the majority of the public in terms of the health service, the Welsh Language Commissioner believes that it is essential to ensure consistency in terms of linguistic behaviour across the health service in Wales in its entirety." A Welsh Government spokesperson said: "The regulations which specify Welsh Language Standards for local health boards, National Health Service Trusts in Wales, Community Health Councils and the Board of Community Health Councils in Wales will be laid before the National Assembly for Wales on 27th February. "We will comment further on the regulations once they are laid."